1972 Laverda 750 SFC. In six years of limited production, just 549 SFCs were built, and today are very highly prized items. In 1999 the Guggenheim Museum in New York staged its now iconic exhibition, “The Art of the Motorcycle”, and in the series of machines from the 1970s, the Laverda 750 SFC was a standout, not just for its vivid orange décor, but for the fact that every sinew of this gorgeous creation screamed elegance of design and pure functionality. That machine was a SFC Series 15,000 of 1975, one of the final batch featuring front and rear disc brakes and a host of other detail modifications from the first SFC, released in 1971. Laverda was passionate about racing, and in particular, Endurance racing – that branch of the sport that seems to thrive in Europe and attract scant interest elsewhere, except possibly Japan. The Breganze factory’s aim was to conquer events like the Montjuic, Spa and Bol d’Or 24 Hour Races, as well as other long distance events, and the choice of the distinctive orange livery was so the machines could be picked out easily from a fair distance. The story of the company founded by Pietro Laverda goes back to 1873, initially producing agricultural machinery for the neighbouring farming community around Breganze in the northern Italian Veneto region. 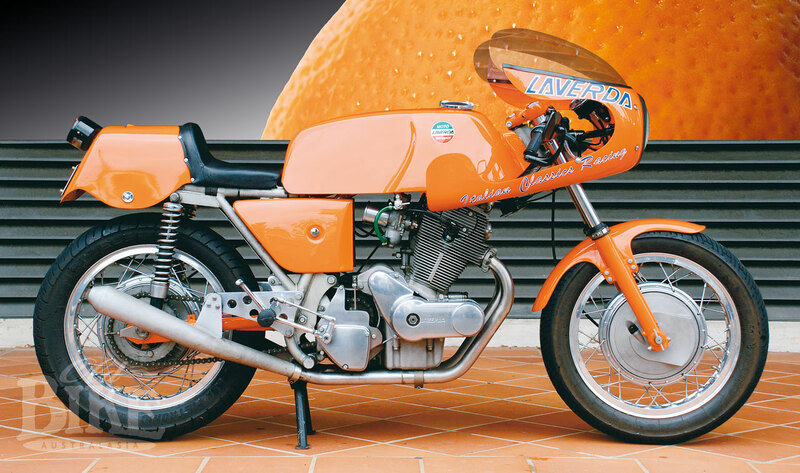 In October 1949, Pietro’s grandson Francesco founded Moto Laverda S.A.S. The first product of the new venture was a 75cc four-stroke single, the Motoleggera or Lightweight Motorcycle. 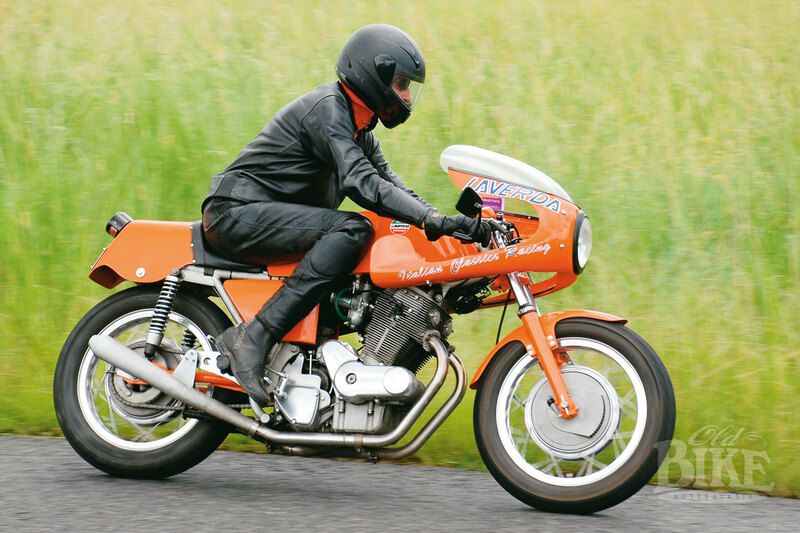 Unlike the multitude of Italian makes that relied on proprietary engines, the Motoleggera used Laverda’s own design, developed by Francesco and Luciano Zen. The little 45 x 46 engine was housed in a pressed steel frame with cantilever leaf-spring rear suspension. Right from the start, the company chose to demonstrate the effectiveness of its products in the field of competition, particularly endurance events like the Milano-Taranto and the Giro d’Italia. Success came instantly in these gruelling events – a clear demonstration of the quality of the product – and soon variations of the original ‘75’ began to appear in more sporting trim. The 75 became a 100, and in 1962, a 200cc twin. A completely new 125 joined the fleet in 1966 – a single cylinder ohv model with the engine slung horizontally from a multi-tube spine frame, but Laverda had eyes on export markets and began making forays into the booming US scene – initially badged as Garellis and later, American Eagles, of all things. But the US, and other markets, wanted something bigger, and the result was the 650cc twin, which was immediately labelled as a copy of the Honda CB72, albeit twice the capacity. Whether Laverda had reversed the usual process and actually copied the Japanese was largely irrelevant, because the new engine was unquestionably a creation of superb quality. Within the space of a few months, the 650 had been redesigned as a 750, and Laverdas of both capacities convincingly cleaned up the outright results of the 1968 Giro d’Italia. A touring model, the GT, was soon joined by the S, or sport model. The engine boasted a five roller- bearing crankshaft, with four bearings supporting the single overhead camshaft, a very robust five speed gearbox and a heavy duty starter motor with a 24 Ah battery. Although the engine was clearly the focal point of the design, the specification for the rest of the machine was just as impressive and designed with durability in mind. Up front were Ceriani forks attached to a steering head with substantial tapered roller bearings, Grimeca brakes and a spine-type frame with the power unit as a fully-stressed member. With the development of the 750S, the factory’s appetite for competition intensified, and in June 1969 three modified S models were sent to the 24 Hours of Oss, where Massimo Laverda (Piero’s brother) and Augusto Brettoni finished a fine fourth. One year later Laverda returned to the Dutch event and took the first three places. First Australian race meeting for the Laverda 750 SFC at Oran Park in 1972. Note the cross-over balance pipes on the exhaust system. The S model was really a mildly-tuned version of the standard machine, but for serious competition something with far more grunt was needed. Thus, in 1971, the SFC (Syper Freni Competizione, or Super Brake Competition) was born. The emphasis on brakes was reflected in ditching the Grimecas for Laverda’s own front and rear drums. The SFC was really an out-and-out racer that was deemed too savage for road use, resulting in a slightly detuned sports model, the 60-horsepower SF. However the SFC was far from a tuned version of the S, with a purpose-built frame with special lugs to take the SFC bodywork and fibreglass fuel tank. Each engine, which has specially cast barrel and head, was carefully blueprinted, pistons exactly weight-matched, assembled to racing tolerances and tested on the factory dyno. Crankcases were heat-treated for extra strength and the whole bottom end and con-rods were highly polished. Inside the head were bigger valves, a shallower combustion chamber and a racing camshaft called the 2C. 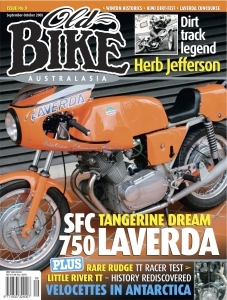 Laverda was virtually unheard of in Australia until the late 1960s, but gradually a dealer network was established and a small band of Laverda enthusiasts began to form. 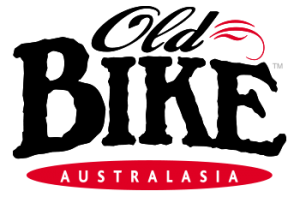 In Sydney, the long-established firm of Jim Eade Pty Ltd, managed by Max Eade, son of the founder, became the agent. A frequent visitor to the Service Department at the time was young Vic Vassella, himself from a famous racing family that included his father Victor and his uncle Frank. 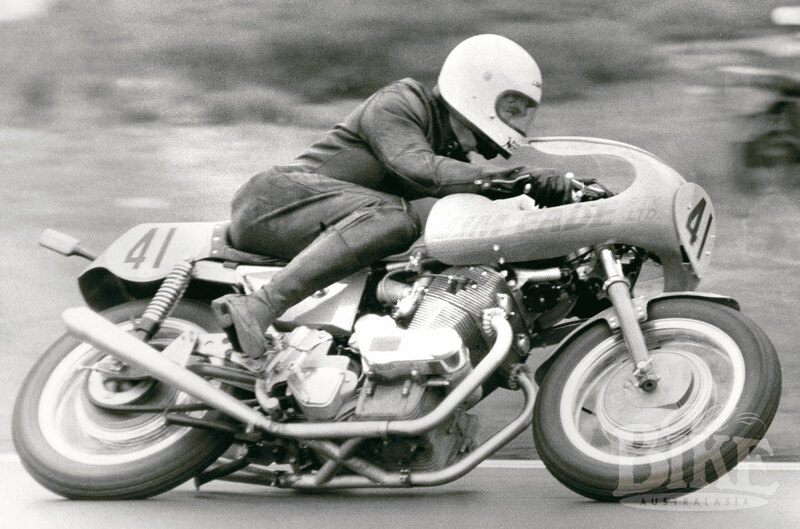 Vic was racing a Norton Commando as a B-grader but hankered for something more exotic, and when he was offered one of the two SFCs allocated to Australia in 1972, he jumped at the chance. The deal was for trade price – $2,700 – on the condition that the SFC was raced to promote the road range. Considering that a new Honda CB750 was $1,670, it was quit an ask. 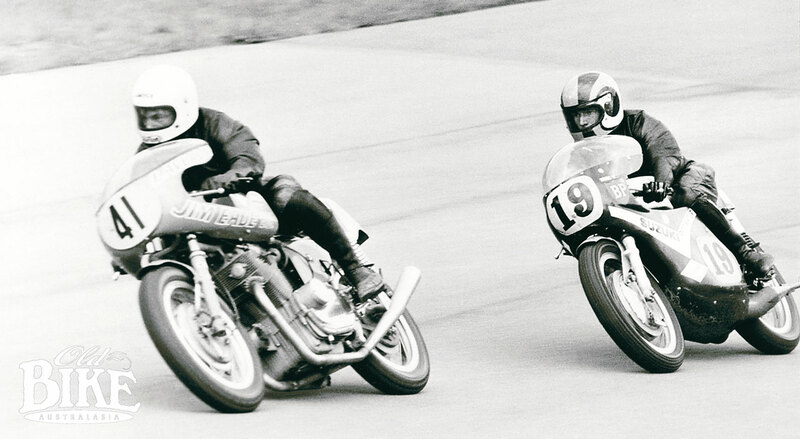 Vic Vassella dicing with Dave Burgess’ Suzuki TR500 at Amaroo Park, 1973. Vic’s SFC, engine number 11085, was one of the third ‘series’, referred to as the 11,000 Batch (the first two ‘Batches’ were referred to as the 5,000 and 8,000, while the fourth Batch, the 16,000, had disc front brakes with a rear drum). The other Australian-delivered SFC, engine number 11088, went to Stanco in Melbourne and was subsequently raced by Jeff Curley. This model had the exhaust system redesigned to run under the engine, instead of being splayed out each side – a feature that inhibited ground clearance when cornering. Unique x-shaped cross over pipes linked the two main exhausts. The engine breathed through Amal Concentrics and the identical Laverda drum brakes were fitted front and rear. The bikini fairing even looked like it came from the same mould as those fitted later to the Ducati SS series. Being designed for long distance events, everything about the SFC was robust, particularly in the electrical department. The starter motor, battery and generator alone weighed over 25 kg, but Vic chose to keep this gear functioning and often employed the push-button technique in push starts for a quick getaway. 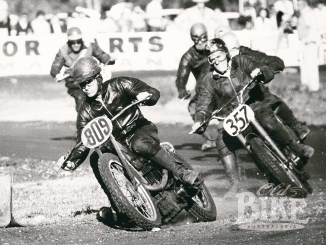 There was nothing specifically in the rule book against it, but the officials took a dim view and when Vic bolted away from the start of the Unlimited B Grade at Amaroo Park in 1973 and eventually finished second to Dave Burgess on the ex-works TR500 Suzuki, he was disqualified. 20 years after he bought the Laverda, Vic advertised it for sale, claiming that the cost of spare parts, should he ever need them, worried him. He found a willing buyer in Chris Cutler, previously a Ducati and MV enthusiast. Chris’s vision was to have examples of “the best three 70’s sports bikes”. Vic says, “When I registered it and sold the bike to Chris Cutler in 1992, I thought I would never see it again”. Things would transpire differently. Chris Cutler’s lanky frame is a tight squeeze on the svelte SFC. Things have snowballed from there. 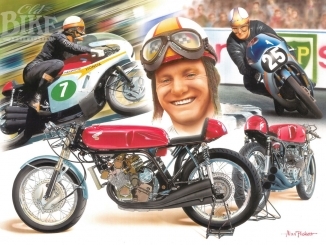 As well as the SFC and the replica, Chris and Steve Battison have four spare engines (all modified SFs) and 2 of the 3-cylinder engines, with plans to built a triple racer, just as the factory did in 1972. In six years of limited productions, just 549 SFCs were built, and today are very highly prized items. 26 years after it arrived in Australia, SFC 11085 hasn’t quite earned its retirement, despite being put out to pasture on several occasions. And by the sound of Chris’ plans, there’s a lot more action left in the old girl yet.